I have heard great things about Reading Eggs and was thrilled to be reviewing it for the first time! You can get a Free 4 Week Trial to check for yourself just how wonderful this program is! There is also a library with over 2000 books. They are organized according to grade level. I know as homeschoolers we often don't work to a specific grade level, so you may be able to find books for your student in multiple grade levels. I started my 9 year old out with a proficiency test. He has long suffered with his reading, and every reading tool we find, we try out. He is reading at a 5.5 year old level right now, but making progress which is a huge blessing. He loves Reading Eggs, and looks forward to it each day. Though it is phonetic in nature, he is still learning each time he does a lesson. He tends toward more right brain learning, but I think because it is so visual for him, it is helping him to learn more fluidly. The comprehensive reading program is grounded in solid educational research and covers the five pillars of reading – phonics, phonemic awareness, vocabulary, comprehension, and fluency. Reading eggs has 120 lessons that are divided into maps. Each map has several lessons. Maverick is on lesson 64 which is on map 7. When you are logged into the parent dashboard there is a Bonus Material section that now has a brand new set of program guides that specifically support homeschoolers! "The colorful and detailed week-by-week overviews make it easy for you to comprehensively cover and track essential learning outcomes for children in Kindergarten through 2nd Grade. Each printable homeschool guide provides a 36-week teaching and learning sequence for Language Arts, Mathematics, Science and Social Studies. It maps online lessons, books, quizzes and assessments to help you plan your child’s learning every step of the way. Best of all, each guide lists reference books in the Reading Eggspress library to complement online learning, and help you expand new ideas and concepts." The Bonus Materials also offers printables to go along with the Map your child is traveling on. For review I was able to have 2 students work on Reading Eggs. I signed up my 2 year old to work on Reading Eggs Junior. With us having to share one computer for school work, it wasn't always feasible to give the youngest a turn on the computer. I was thrilled to find that there is an app on my Apple phone where she can do much of the same things that she would do on the computer! I just had to log into my account. That really gave us a great opportunity for her to check out Reading Eggs Junior. There is a lot of activity on Reading Eggs Junior, including many songs, some just for fun, and some educational like the ABC's. There are lessons on each of the letters, and you go through them in order. There is rewards for the student once they get through a letter, they collect eggs with objects hidden inside. My 2.5 year old loved clicking the egg to see what prize she got! I am fairly sure she could have sat all day and done her 'school' work. So fast paced it kept her interest! 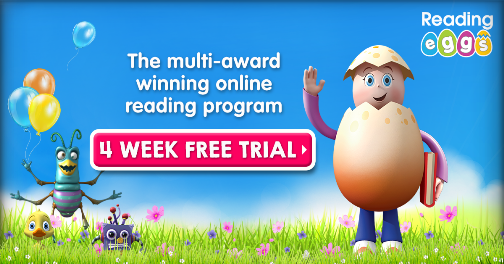 Reading Eggs Junior has lots of great fun for your 2-4 year old. We learned some letters, sang some songs, and colored some pictures. I have a Reading Eggs subscription for 6 months, and plan to keep going with it as long as my kids are learning! I highly recommend this online program for delayed readers. Find Reading Eggs on these social media sites. See what some of the other Crew families thought of Reading Eggs by clicking the photo below.